**My Desert Cottage**: Where Bloggers Create 2015 is less than a week away! Where Bloggers Create 2015 is less than a week away! 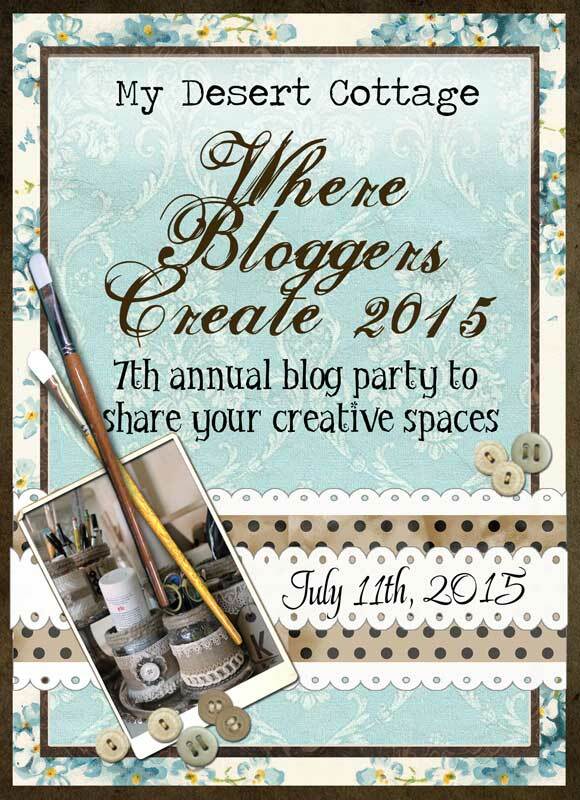 Just a reminder that this years Where Bloggers Create party is coming up on July 11th. That's less than a week away!! Are you ready??? It's going to be a lot of fun and I am sure, (as always) chock full of wonderfully inspiring rooms! My post and the link list will go "live" the night before so that it's ready for our friends over seas! I hope to see you all then!!!!! Hi Karen, I said I would participate but unfortunately I won't make it. I have too much going on right now and my studio looks like a big mess. Besides, I wasn't able to do all the changes I had planned, so that it would reflect my current taste. Hopefully you'll host the party again next year. I wish you lots of fun with this year's participants! Can't wait! I have been re-arranging and working in my craft room for months now!! I can't wait even though I'm not contributing this year..Not very creative these days and if I am, it's the kitchen counter.. I have wanted to join the party for a while now but just didn't have my very own creating space...but now I do. It's very small but it's my very own. Look forward to joining. So much fun. I got most of my pics taken today and will write my post tomorrow. I am putting a pic on Instagram tomorrow to let people know about the party.